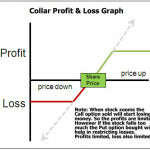 Married or Protective puts are helpful when you want to protect the profits made from a stock, but do not want to sell it as of now to lock in the profits. 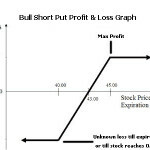 Married or Protective puts are also helpful when you bought shares and fear that the stock value may fall – but for some reason you do not want to sell the stock. Married puts will help in case the stock actually falls. Here is a graph of married puts. 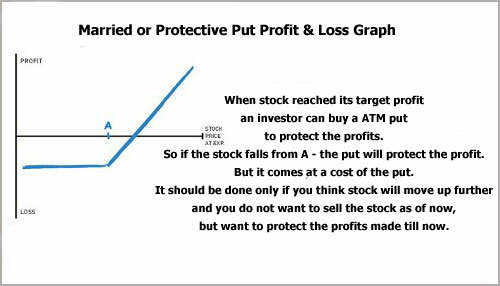 If stock falls below “A” the protective puts will save the investor from losses in the stock. Let me now explain in details. 2. Buy ATM/OTM put of the same company. Even if you are not in a loss, one thing is pretty sure you lost a great amount of profits that you could have made had you sold the shares when they were at a higher level. Unfortunately greed came in and you kept it on hold. 🙂 Well don’t worry, it happens with everyone. Nothing to feel guilty about it. If you are still in profit, my advice is that you should get out, and re-enter at a lower levels. The problem is how on earth you know if it will ever go more down and where to re-enter? You can however protect further downside of the stock by a simple strategy called married puts. Which takes us to the second option. Buy ATM/OTM put of the same company. 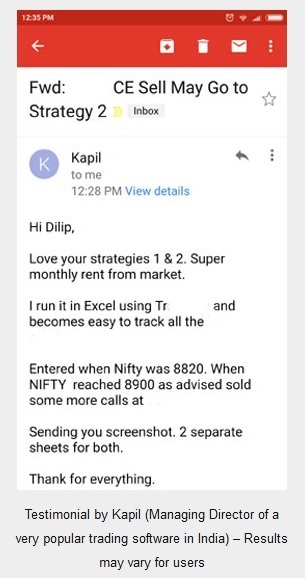 Note: Married puts are useful if you have a lot at stake in that particular stock, at least 2-3 lakhs or equivalent to its leverage in futures and options. For example right at the time of writing this article HDFC Bank is trading at Rs. 588.00 and let us suppose you bought 500 shares of HDFC Bank at 590.00. 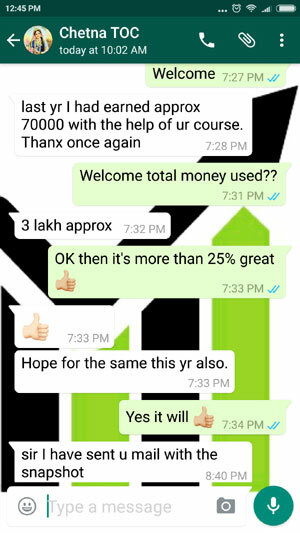 So your total investment is 500*590 = Rs. 295,000.00. The markets are falling – especially the banking sector. You fear that HDFC Bank may also fall and so you may suffer a loss, but you want to hold the stock and don’t want to sell right now and not lose money too. 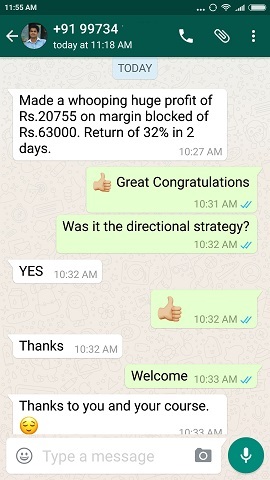 You can then buy a put option of HDFC Bank to protect your losses from the downfall. Now if HDFC Bank falls, you need not worry as the put you bought will also increase in value and you can sell it at an appropriate level to realize a profit. Now your buying cost of HDFC Bank will come down due to this profit. 1. Prices moves down: You profit from the put bought. Your cost of buying the stock comes down. 3. Prices move up: You profit on the stocks bought. However you lose money on the puts bought. If prices move beyond the breakeven point you will make money. The premium paid to buy the puts should be added to the cost of buying stock. This is your breakeven point. Anything beyond that is your profit. Great. But what is the risk? The risk is if HDFC Bank shares stays at the same level or move up. The worst situation is when they stay at the same level. Your puts will expire worthless and you will lose whatever you paid as premium to buy them. If the shares move up, you will gain some from the up move but your puts will get lower in value as the stock price moves upwards. But after your breakeven points you should be in profits. When is a married put helpful? Yes taking a married put decision can bring rewards, but the risk is definitely there. You may ask why not sell futures of the same company when the stock price is going down. Yes you may be right. Yes there are no premiums to pay and the cash also comes from the collateral from the same shares. 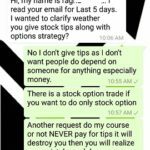 You can use your collateral to buy options as well but at least you know your max loss when buying options. In futures you have no idea as it can be unlimited loss, so using collateral money in not a good idea. 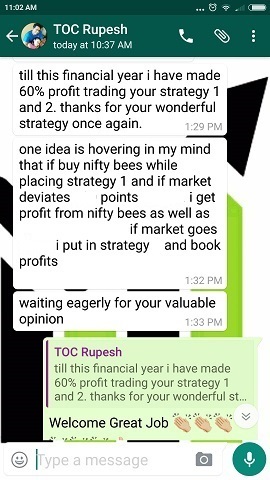 Selling future is a better option if the stock price stays there or goes down. However what happens if there is some good news and the stock opens gap up the next day morning? You will make money in stocks you hold, but lose the same amount of money in the future. Your buying cost of the stock will go up. Unfortunately you will have to pay this as MTM (mark to margin) and if you don’t have cash your broker may sell some of your shares to pay for the losses you incurred in the future. Not a good situation to be in. With married puts you know exactly how much you are going to lose. 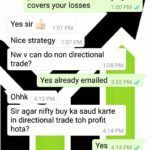 And if your view was wrong you may actually sell the put and restrict your losses. It is your call, but experts always say married puts not married futures. So there is something to it. Important Note: If you are not sure of the movement or if you think there will not be a significant drop in the share value do not attempt a married put. You may lose the premium you paid.